Imagine the delight when one fine morning beautiful little potted plants were to be found on all over at Avvashya House It is all part of our Allcargo greens campaign to turn our HQ into a haven of green, not just beautiful to look at but inspiring us every moment of the day to think green. A plant appeals so deeply to all of us in large part because it is a living thing that responds like us, and to us. Like us, because it thrives on water and nutrients, growing perceptibly day by day from a young shoot into a full, glorious plant. To us, because it encourages us to seek the light incessantly, and turn to it. The plant world can speak to our soul in all its hues and flowerings, inspiring us to resolutely carry on with our lives and keep adding to the world around us. 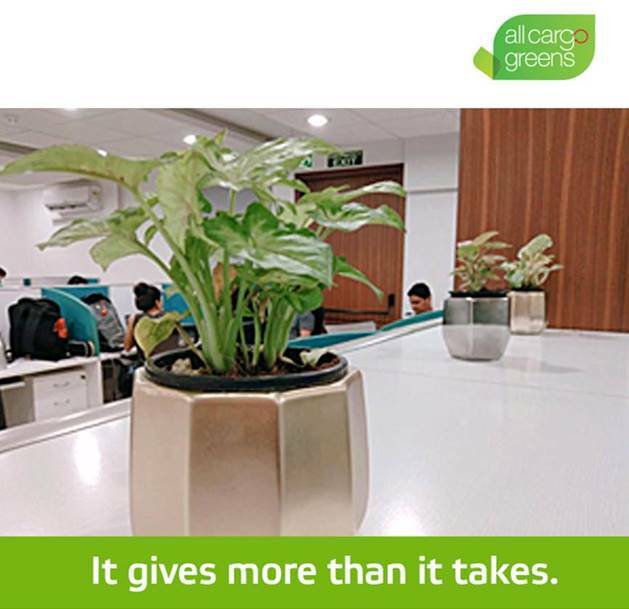 Allcargo's little plants, hopefully, will grow into large ones, and transform our office into a landscape dotted with green. This is exciting because we already have a beautiful office and the little plants make very appealing little spots of growing life on every desk. We all look forward to the day when they have grown so well, they will transform the entire building into an eloquent landscape of our commitment to the environment.